Create a happy ambiance with this uplifting blend of citrusy and refreshing essential oils in a 100% natural soy wax base. Our wicks are 100% cotton, lead-free, bleach-free and chemical-free. Trim wick to 1/4 inch before each use. Do not burn for more than 4 hours at one time. Place candle in a draft-free area and on a heat-resistant surface. 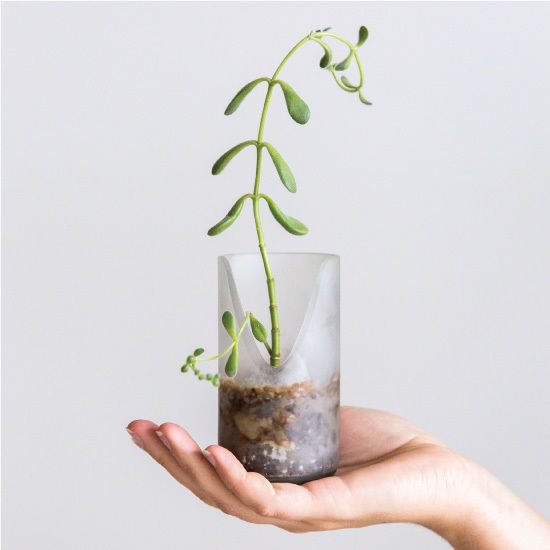 After the candle has burned down, the container can be reused as a plant vase or other container. See the bottom panel of your candle for safety information. To prevent fire, do not leave burning candle unattended. Do not place burning candle on or near anything that can catch fire. Keep burning candle out of reach of children and pets. 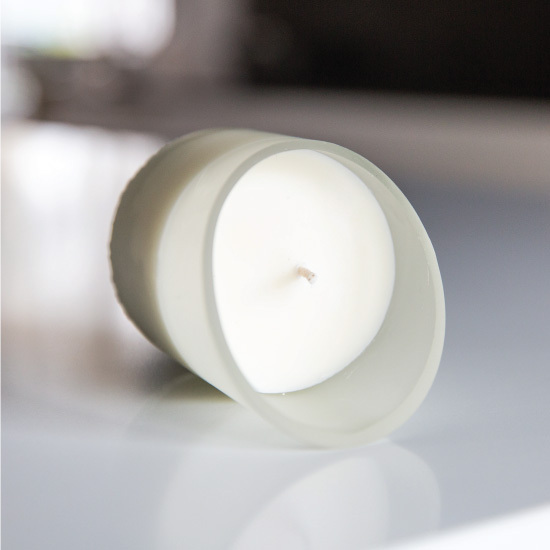 Do not allow candle to burn below 1/2" or if wick shifts off center as glass may overheat and break. If wick is not centered, blow out candle and stop use. Allow candle to cool completely before handling. Bright, sweet and citrusy; brings a sense of balance to your mind. A sunny, citrusy uplifter to awaken your senses. 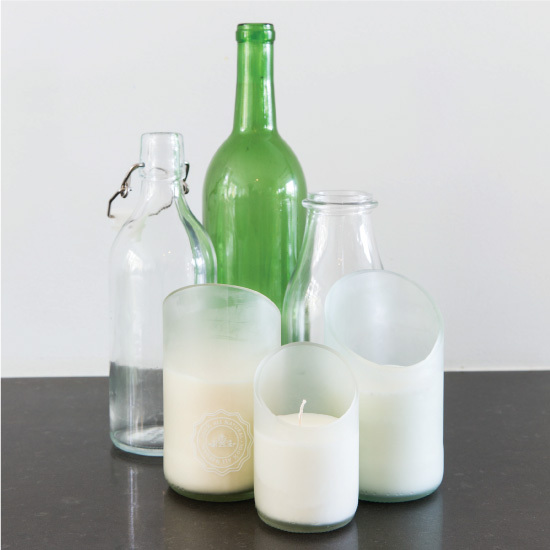 To help keep glass bottles out of the ocean and in landfills, our candle holders are made from recovered glass bottles found in Thailand. Our candles are free of paraffin and synthetic fragrances. Made from 100% soy wax, a natural, biodegradable and renewable resource, they are long-lasting and clean-burning. Since soy is derived from plants, our candles do not produce the toxins normally associated with paraffin-based candles. This means, you can breathe easy knowing there’s only the goodness of nature lighting up your environment. When your candle has been used, your glass holder can be reused as a planter or a decorative container. Just imagine all the possibilities. Un-lit, this candle smelled like the Liquid Sunshine oil blend . Once lit, it smells like something like a woodsy campfire. Not horrible, but really not at all what I had wanted. Husband asked what it was supposed to smell like (without knowing it was Liquid Sunshine ). I recently purchased this candle out of town to freshen up the stale air in the hotel room where I was staying. Unfortunately I forgot to buy something to light it with so I only tried it when I returned home. I'm extremely disappointed with this purchase - the candle throws absolutely no scent when lit - even if you are sniffing directly over it you cannot smell the essential oils. I don't have a Saje store near me or I would have definitely returned this. I know most of the other Saje products are amazing but avoid this candle! I'm glad I read all the reviews, very disappointed to hear, unfortunately I won't be purchasing your Liquid Sunshine candle.